Resetting or restarting your Wemo Smart Light Switch, F7C030 is easy with its dedicated Reset and Restart buttons. The Wemo Light Switch is not detected by the Wemo App. The Wemo Light Switch is blinking orange after a firmware update. The Wemo Light Switch has become unresponsive to both the app and manual controls. You recently changed your Wi-Fi router, or your Wi-Fi name or password. You want to erase any stored settings. 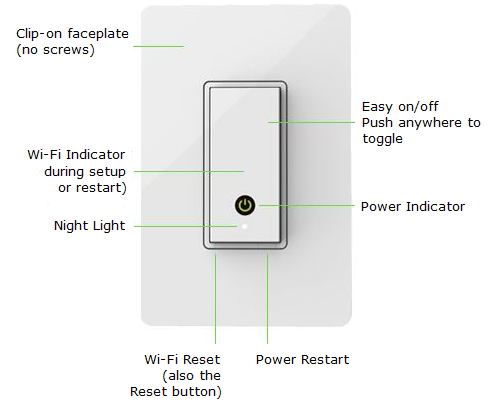 NOTE: On the Wemo Light Switch faceplate, the Reset button is also known as the Wi-Fi Reset button, while the Restart button as the Power Restart button. To restart the Wemo Light Switch, press the Restart button for 1 second and then release. The Wi-Fi Indicator light will begin to blink green to show it is restarting. If the Wemo Light Switch is not responding to the Restart button, turn OFF the power of the Wemo Light Switch by turning the circuit breaker OFF and then turning it back ON. NOTE: Images may differ depending on the device (iOS or Android™) you are using, but the interface will mostly be similar. Where needed, the specific differences will be shown to guide you better. Step 2: Tap on the pencil icon. Step 3: Tap your WeMo Light Switch. Step 4: Tap Reset Options. 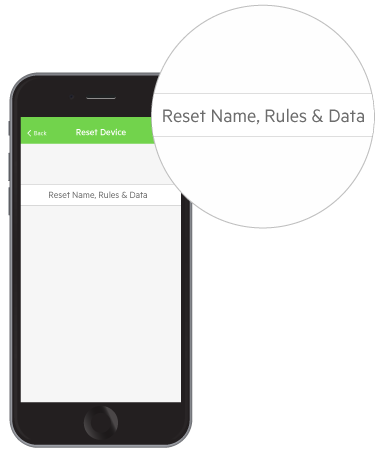 Step 5: Tap Reset Name, Rules & Data for iOS devices or Erase All Content and Settings for Android. IMPORTANT: This process will delete all previous settings done in the Wemo App and reset your Wemo Light Switch to factory defaults. 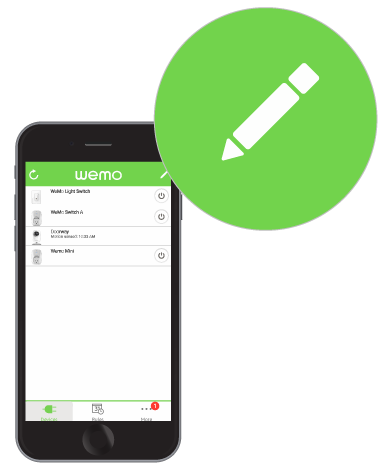 You will need to set up the Wemo Light Switch with the Wemo App again. Step 1: Press the Restart button for 1 second and then release. The Wi-Fi Indicator light will begin to blink green to show it is restarting. QUICK TIP: If the Wemo Light Switch is not responding to the Restart button, turn OFF the power of the Wemo Light Switch by turning the circuit breaker OFF and then turning back ON. Step 2: Immediately press and hold the Reset button for 5 seconds. The Wemo Light Switch Wi-Fi light will blink orange rapidly, indicating a successful restore. The Wemo Light Switch will take about 90 seconds to perform the restore. When ready, the Wi-Fi Indicator light will begin to alternate between green and orange to show it is ready to be set up. 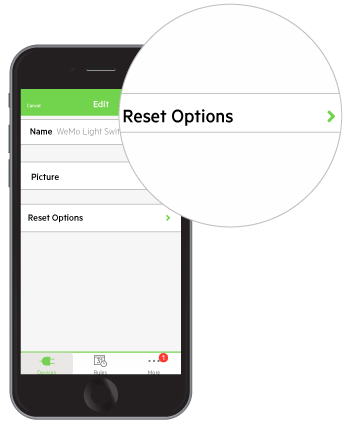 For instructions on setting up your Wemo Light Switch, click here. 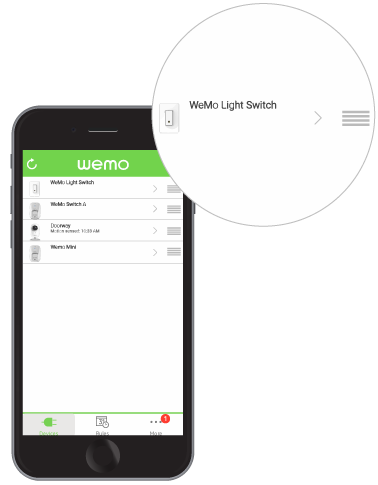 Why the status light is blinking on my Wemo® device?